Get Lost…Be Found. Get Lost Travel Vans is a smaller, affordable alternative to the traditional Alaska RV rental. A camper van is the perfect way to see Alaska! It’s easy to drive, simple to set up, and fun to get around in. Our camper vans are converted minivans, carrying almost all the comforts of home but without the price tag or the giant vehicle to go with them. The camper vans come with kitchenettes that include a fridge, two-burner stove, and sink with running water along with pots, pans and place settings. Inside the van, the seating area converts into a table with benches or into a double bed, with extra storage found underneath. 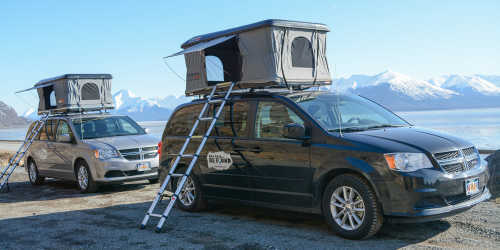 The rooftop tent pops open to reveal a double bed with sleeping area for two. All of our van rentals include linens, kitchen implements, and unlimited mileage! It may look like a regular minivan on the outside, but inside, it’s your home away from home. Where will you Get Lost?